Being a huge Beatles fan, especially of their later period, I always wondered if anyone knew what film stocks they used to shoot the final movie, Let It Be? Recent official releases included nice scans of some songs of the movie, the image looks quite grainy but I really like it. in 1968 Kodak introduced EASTMAN Color Negative film, 7/5254, the Let It Be movie was shot in January of 1969. I assume they used EASTMAN Color Negative film 7254 as it is a well-known fact that 16mm cameras were used plus you can see them in many shots. Or would there be a possibility that the movie was instead shot on some sort of reversal stock, as originally the plan was to show it on TV (easier to use that as a source?) and only later they horribly cropped it to a wide screen format and showed it at cinemas? Who of knows anything about this? I am thankful for any information to finally find out more about this. IMDB says it is a 16mm blow-up. If it were a U.S. documentary, odds would be higher that it would have been 16mm Ektachrome of some variety, but Europe was starting to shoot more 16mm color negative than the U.S. by the 1970's, so I don't know which was used. 100 ASA color negative would have yielded a grainier blow-up but with more natural contrast than color reversal (if the slower Ektachrome stocks were used) would have. It was shot on 7254 I know this as I was one of the many operators on it . Wow, that is SO awesome! It's thrilling to meet someone who actually worked on that film! May I ask you some questions, please? Do you still remember which cameras were used? Were you on the rooftop? Can you be seen in some scenes? Did you use 400ft of film mostly and had to change magazines every 11 mins or so? So it was shot on negative and then copied? Any idea if the orginal neg still exists at Apple and that's what they scanned from rather than a later generation copy? Any idea if any 16mm prints exist? Would be awesome to have such. Were you there when George quit on the 10th? Sorry for all the questions, but I'm just so amazed to get to talk to someone who was there! I was using An Arri BL , Yes on rooftop shooting Get Back , back of my head is seen a few times I was lying down on the floor in the front . Yes 400ft loads . That is all the answers i can give you sorry . 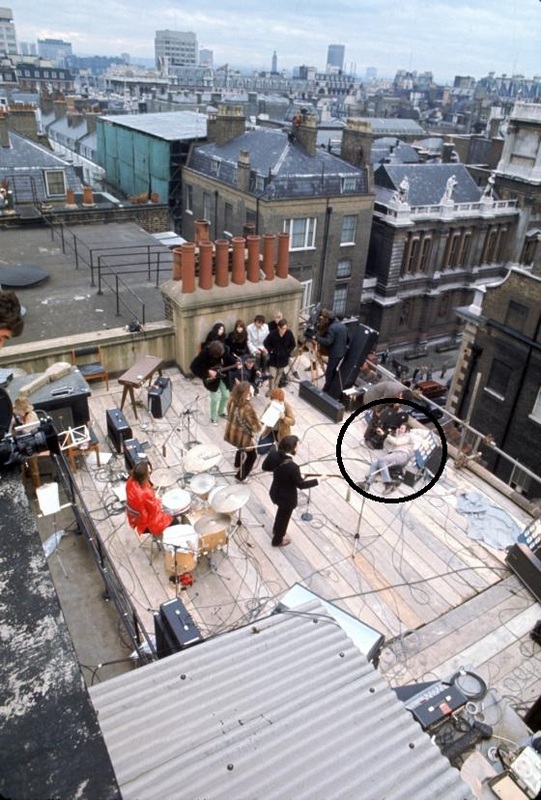 I think I can spot you in that image that was taken on the roof (taken from www.beatles.com). Must have been quite some experience to work there. The camera on the left on the parapet is a BL, almost cropped out- Angenieux 12-120? That one on the wedge looks like something with a side finder and mouse ear mag. I know nothing, but could it be a Mitchell NC? They'd be miming to playback presumably so it didn't need to be blimped. The concert was live, no playback. Hmm, what about this image then (in another forum someone told me that might be a BL with a coaxial 600m magazine)? That's the only other one I found with someone shooting whilst being on the floor. Yes, both those are BLs. It's a 1200' mag btw, same as on the BL in the first photo. The one on the chimney stack has the standard 400' mag. But I'm not sure the one you circled in the other photo is a BL. If the whole show was shot in 16, it can't be an NC- maybe a Mitchell 16 or an Auricon? Same for the one on the sticks? According to the other forum the one I circled in the first image could be an Auricon Super-1200. I was just going from John's "lying on the floor" comment, found the image and missed the wrong shape of the camera. Looking at the hairstyle it's the same man with the 1200' mag in both images, so if John says he was on 400' loads, that must be him up the chimney with the specs. I wonder what is being handed to him. It doesn't look like a spliff. I am thinking it was an Auricon Pro 600; the mag is too small for a Pro 1200. Also, I've never seen a gray Pro 1200, only Pro 600 and before had gray paint. All the Pro 1200's I have owned or seen are bronze/tan color wrinkle finish paint. Didnt wear specs or smoke spiffs ! Mark . Its me on the wide shot with a bit of London in background . So you are indeed the person I circled in the first picture? 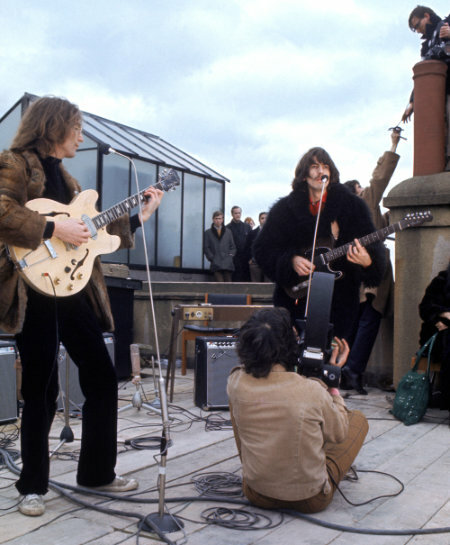 Were you only present for the rooftop gig as they used much more cameras there or did you shoot scenes during the entire January sessions? Did you use the same film stock indoors and outside, in both cases the 100T? Yes thats me . I only was involved with shoot on the roof for one day . The same stock would have been used for indoors and out. Outside using a 85 correction filter bringing the speed down to 64asa. Great, thank you very much for sharing. You definitely picked a very historic moment to be there at that place at that time, seeing them do their last concert ever! Yes although I did not know it would be their last. I think no-one really knew it at that time for sure, not even they themselves. May I ask, how did you get involved in it? Did someone contact you and ask you to quickly join the shoot as they wanted to use much more cameras on the roof and only decided to go there a few days prio to the actual shoot? Or did you know any of the people involved beforehand, like the director Lindsay-Hogg or other people of the crew? I got the job one day before the shoot via the then film union A.C.T.T . Production were asking for young camera operators and I was certainly young . Did they tell you who you will be shooting for? Did they say Beatles or that you'll be on the roof, or just tell you to come by? I was told everything and met the Dp day before for a beer . Were you nervous because it was such a big band you were about to meet? Ever been a fan? Did you ever get to see any dailies/rushes of what you have shot or only the final movie when it was shown in the cinemas? Some black and white rushes surfaced on Youtube, but none from that day, and I don't think color rushes were done back then for that movie. B/w rushes from colour neg were always a bit cheaper. I assume the difference was less by the 70s but even when I was at college it was a penny or so a foot, maybe 10 or 15%. Of course cinematography students weren't allowed to save money that way even if we'd wanted to- the colour was kind of important. Yes Tony Richmond one of the first films he got a Dp credit on . Never saw any rushes . No not nervous and yes loved The Beatles . Mark my exposures are always correct ! in this case as we knew it would be blown up to 35mm over exposed 1/2 stop to keep grain levels down . After that I have always over exposed . Did you see the recently released Beatles 1 Bluray? The shots taken from the Let It Be movie in there look absolutely awesome. None of the older video or DVD releases do the film source justice, it always looked so blurry, but that latest scan shows the beauty of the 7254 and I agree, the rooftop shots in particular have much less grain than other shots. I just wonder why many of the indoor shots show quite some amount of hairs in the gate, really big ones in many shots. Was there a higher probability for this to happen with the used equipment of the time or rather caused by the hectic schedule of the documentary?